The milestone signaling the beginning of the reproductive stage is panicle initiation (PI). At this moment, the cells at the shoot apex, which is just above soil, start transforming into the panicle; however, this “primordial” panicle is not visible yet. All that can be noticed is a light green band at the upper-most internode referred to as “green ring” or PI. About a week later, when the panicle grows to 1/16th of an inch long and is visible with the naked eye, rice is at the panicle differentiation (PD) stage. It is very important to correctly identify when plants reach PI and PD since midseason N should be made at or just prior to this growth interval. The internode elongation that is often used as an indicator actually occurs after PI. Calrose varieties do not respond in terms of yield gain to N topdressing beyond PI based on UC research. In fact applying additional N later in the season may increase disease severity and ‘blanking', as well as delay maturity. Midseason N application may not always be necessary. If the soil has a good supply of N throughout the season, maximum yields can be obtained using pre-plant N fertilizers only. However, there are several factors that prevent this from happening, such as extended drain periods, high soil permeability, or a planned management strategy. Several methods can be used to estimate the N nutritional status of rice plants at midseason: leaf chemical analysis, chlorophyll meter and the leaf color chart. In all cases, leaf samples should be taken at or slightly before PI. The Y-leaf should be used to determine plant N content. The Y-leaf is the most recently fully expanded leaf. It is important to know the stage of growth when sampling for leaf-N because the N content can vary drastically over time. The adequate N range for tissue N at PI is 3.2 – 3.6% (Table 1); concentrations below this range indicate an N deficiency and warrant topdressing. Table 1. Guide for leaf nitrogen percentages at different stages of growth. Source: Rice Nutrient Management in California. UC ANR No. 3516. The chlorophyll meter can be used to estimate N content by measuring the amount of light absorbed by chlorophyll in leaves. The meter must be calibrated against leaf samples analyzed in the laboratory. For cultivar M-205, a meter reading of 32 corresponds to the critical value of 3.3% N. The UC leaf color chart is a very practical, accurate and reliable method to estimate plant N content. It consists on a series of panels with colors that match the color of plants with different N contents (Fig. 1). 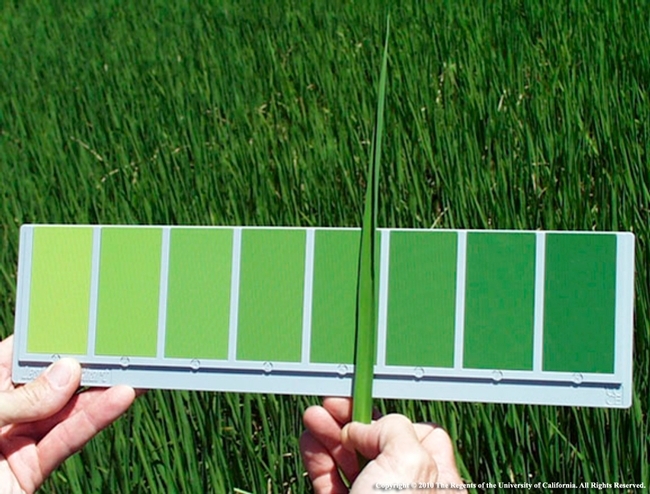 By comparing the chart with color of the Y-leaves, an estimation of the N status of the rice plant is possible. The chlorophyll meter and the color chart have the advantage of allowing “real time' determination of plant N concentration, whereas the leaf chemical requires a few days for processing. The chlorophyll meter ‘samples' a very small area of the leaf (2 x 3 mm). Therefore a large number of readings are necessary to get a reasonable estimation of leaf N levels. Figure 1. Leaf Color Chart for evaluating nitrogen status in rice. Keep in mind that greener is not necessarily better. Studies conducted on M205 and M206 at multiple locations demonstrated that tissue N levels at PI above the critical level do not translate into higher yields (Fig. 2). Figure 2. 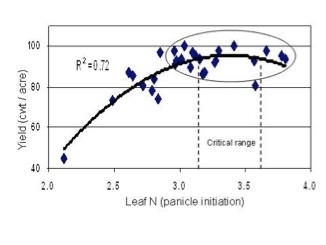 Yield as a function of leaf N at panicle initiation. Pooled across varieties (M-206, M-205) and location.